What lies beneath the surface of the world oceans? What mysteries lurk in the darkness thousands of feet below? Join the adventure as the depths of the ocean are explored in this fascinating new book that brings the wonders of the ocean to light. As the fourth entry in the Wonders of Creation series, this book answers all of these questions and more, with full-color photos, charts, graphs, and illustrations that bring the murky, mysterious depths of the ocean to life. 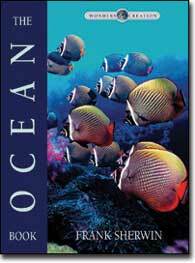 This superb book is a fantastic supplement to any homeschool curriculum, and contains many scripture references where God speaks about the oceans in His Word. It can be used as a reference book, and also makes a wonderful leisurely read. All ages from a middleschool level and up will enjoy this informative and fascinating book. Where did all the salt come from? What keeps the oceans from freezing? What causes the tides and why are they beneficial? This page was last modified on 19 December 2012, at 12:51.